How did the largest/longest dinosaurs hold their head and necks up? After seeing the images in the articles shown below, I am having a tough time understanding the mechanics of how these incredibly long and heavy necks can be supported outstretched like this. A rigid beam or tube would remain fairly straight through compression on the bottom and tension on the top, and since there is muscle, tendon, ligament and bone, I know the necessary mechanical functions are there somehow. Is there one "neck muscle" along the top that holds the neck "up", or many short muscles between vertebra? Where is the origin of the tension, the shoulders or the pelvis, or is it all the tension distributed along the whole spine from neck to tail? above: Titanosauria of Chubut from here. 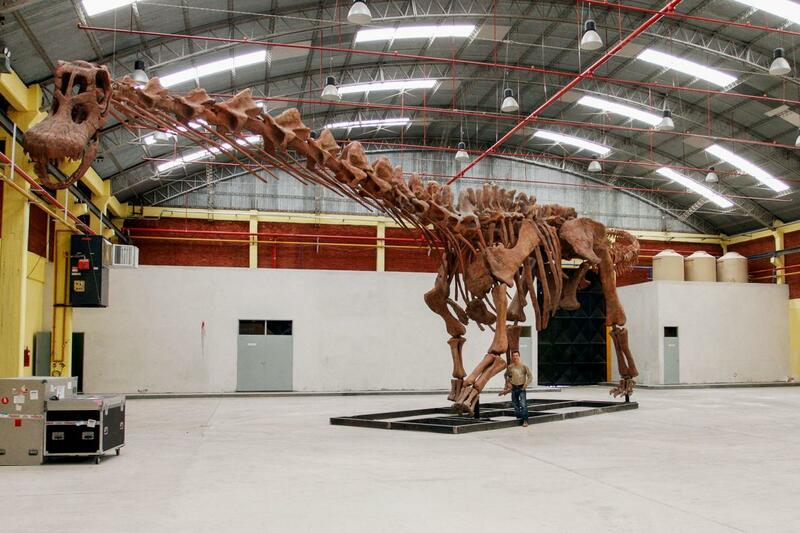 above: A reconstructed Patagotitan mayorum, a 70-ton dinosaur discovered in Argentina. 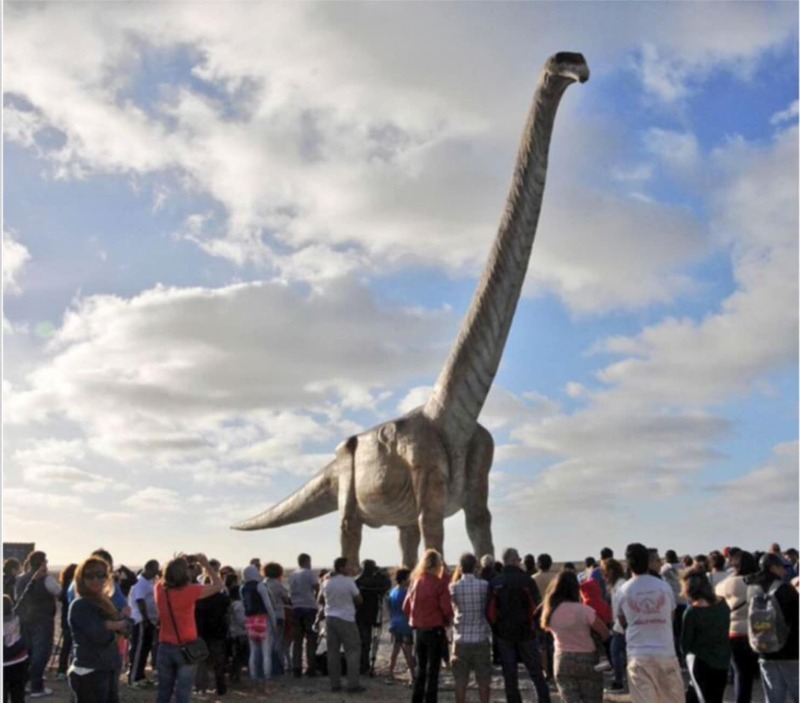 (Courtesy of José Luis Carballido) from The Washington Post article Which dinosaur is the biggest? There’s a new contender — and it’s alarmingly large. above: A reconstruction of the newly named titanosaur Patagotitan mayorum. from The National Geographic article New Dinosaur Species Was Largest Animal Ever to Walk the Earth. Several anatomical features enabled this extreme elongation, including: absolutely large body size and quadrupedal stance providing a stable platform for a long neck; a small, light head that did not orally process food; cervical vertebrae that were both numerous and individually elongate; an efficient air-sac-based respiratory system; and distinctive cervical architecture. Relevant features of sauropod cervical vertebrae include: pneumatic chambers that enabled the bone to be positioned in a mechanically efficient way within the envelope; and muscular attachments of varying importance to the neural spines, epipophyses and cervical ribs. A stable platform for a long neck. Large, heavy quadrupedal bodies, so the long neck didn't unbalance the animal when it stretched out. "A small, light head." Sauropods didn't chew their food, so didn't need large muscles or heavy bones in their head, so they didn't have a heavy weight at the far end of the long neck. Numerous small, elongate cervical verterbrae. Sauropods had 12-19 vertebrae in their necks. By contrast, giraffes have seven, each of which needs to be large and heavy, limiting how long the neck can be. Efficient respiratory system. Sauropods, like modern dinosaurs (birds) have a more efficient respiratory system than mammals, so they could tolerate the inefficiency of a long trachea. Pneumaticity of cervical vertebrae Sauropod vertebrae had air sacs (i.e. hollow pockets of air) in them, making them much lighter than mammalian vertebrae of the same size and strength. Figure 4: Extent of soft tissue on ostrich and sauropod necks. 1, Ostrich neck in cross section from Wedel (2003, figure 2). Bone is white, air-spaces are black, and soft tissue is grey. 2, Hypothetical sauropod neck with similarly proportioned soft-tissue. (Diplodocus vertebra silhouette modified from Paul, 1997, figure 4A). The extent of soft tissue depicted greatly exceeds that shown in any published life restoration of a sauropod, and is unrealistic. 3, More realistic sauropod neck. It is not that the soft-tissue is reduced but that the vertebra within is enlarged, and mass is reduced by extensive pneumaticity in both the bone and the soft-tissue. In effect, sauropods inflated their vertebrae within the muscular envelope of the neck, moving the bone, muscle and ligament away from the centre so that they acted with greater mechanical advantage: higher epaxial tension members, lower hypaxial compression members, and more laterally positioned paraxials. Taylor and Wedel go into this in much more detail, with many helpful diagrams, and the paper is open-access, so I won't repeat all their points here. They talk about neural spines, epipophyses, cervical ribs, and muscle attachments in various combinations. My favorite hypothesis is that long tendons allow an animal to shift the bulk of the muscle–and therefore the center of gravity–toward the base of the neck, but that long unossified tendons can be distorted through stretching, which wastes muscular energy. Ossifying those long tendons is like putting bony wheelbarrow handles on each vertebra, allowing the muscles to move the vertebra from a distance without so much wasted energy, and probably with finer positional control. That's just one aspect of the way sauropod necks were structured. TL;DR: Sauropod necks could afford to be relatively light, because of the small head; their neck bones tended to be relatively hollow and light for their size; their scale and shapes meant that muscles had good mechanical advantage; and different species had other adaptations including ligaments and stiffening bones that also helped. Not the answer you're looking for? Browse other questions tagged muscles bio-mechanics dinosaurs or ask your own question. Is the Klein's bottle a good analogy to the relation between T-tubule and sarcolemma? What will happen if the biceps stop contracting and instead triceps contract? How can skeletal muscles in the human body be modeled as levers? How did giant sauropods satisfy their daily energy needs, considering their relatively small mouths? How didn't large, highly active dinosaurs overheat?